Google, Airbnb, and Amazon all have one thing in common: an incredible user experience (also known as UX). Their principle websites are straightforward and easy to use, and many (including Airbnb co-founder Mike Gebbia) attribute the success of these “startup unicorns” to strong UX design. CNNMoney’s 100 Best Jobs in America list for 2017 includes both UX designers and UX researchers. The ranking was based on growth rate, salary, and job satisfaction. User experience researchers came in at No. 39, with a median annual salary of $106,000 and an estimated 10-year job growth of 19 percent. User experience designers were No. 99, with a median annual salary of $85,900 and an estimated 10-year job growth of 13 percent. So, what’s the difference between a UX researcher vs. a UX designer? One of a UX designer’s mains responsibilities is to make websites, apps, and other pieces of technology as easy to use as possible. In order to do that, they must understand their target market: what the consumer wants, what motivates them, and what turns them off. This is where a UX researcher comes in. What Is a UX Researcher? UX researchers are akin to data scientists: rather than hypothesizing about what a consumer may like, they analyze actual consumer behavior and form data-driven insights to address the needs of these consumers. UX researchers replace guesswork with informed insights and then work with UX designers, engineers, and product managers to turn these insights into actionable, consumer-centric results that resonate with the audience. What Skills Do You Need to Become a UX Researcher? If you’re wondering how to get into UX research, UX Planet says it’s beneficial to have a background in a relevant field such as marketing, cognitive science, psychology, economics, or information science. You’ll need to have an analytical mind and know how to read data, but soft skills are important as well, as you’ll need to know how to read people. 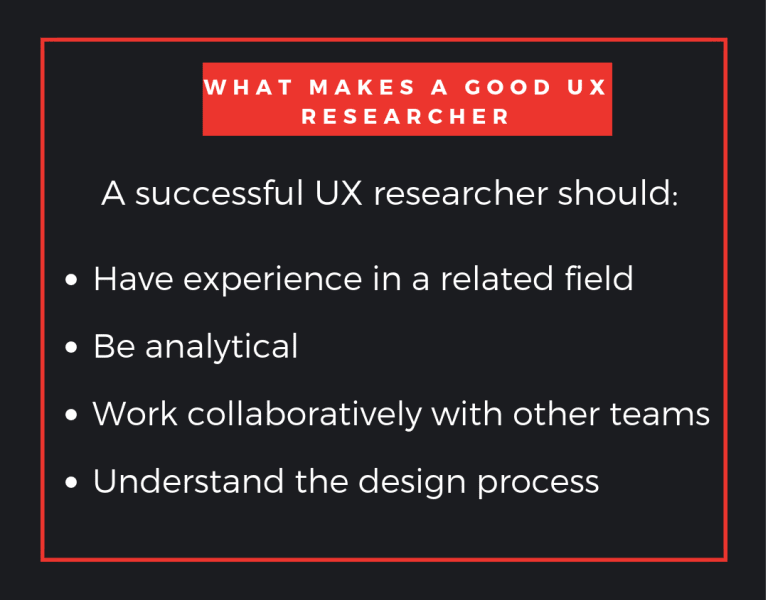 UX researchers need to be collaborative and know how to work well with all types, as a UX researcher works closely with not just UX and UI designers, but engineers, product managers, and project managers as well. Last but not least, it’s imperative to have an understanding of the overall design process. What Does a UX Researcher Do? UX researchers employ a mix of quantitative and qualitative research. Quantitative research is measurable, while qualitative is not. How many users visited your homepage is an example of quantitative research; determining why 500 people abandoned their carts at checkout is an example of qualitative research. Observation: UX researchers observe people interacting with a product and look for behavioral (i.e., unspoken) clues to understand what a person thinks of a product. Do they find it easy to use? Did their behavior reflect what the UX designer intended them to do? Understanding: UX researchers seek to understand consumers’ “mental model.” According to Nielsen Norman Group, a mental model is “what users know (or think they know) about a system such as your website.” When a person visits a webpage, they act according to their mental model. If they click the magnifying glass icon, they expect it to open a new search; if they click on your logo, they expect it to direct them back to the homepage, and so on. Thus, it’s imperative that a product’s design is well aligned with a consumer’s mental model. Analysis: UX researchers must not only be able to observe and understand consumer behavior, but they must also be able to interpret it as well. They need to analyze their findings to identify patterns and trends that they can then share with the UX design team in a digestible way. Face-to-Face Interviews: These can be one-on-one or via focus groups comprised of multiple people. The UX researcher can ask specific questions, simply engage in conversation, or, in an ethnographic interview, observe the participants in their natural settings to see how they interact with a website or product. User Surveys: Researchers can send online surveys to a targeted group to get their thoughts on a product. While this is a cost-effective way of eliciting a high number of responses, the downside is the lack of behavioral clues. As a researcher cannot physically see her target, she misses the chance to pick up on things that a survey cannot. Usability Tests: Researchers can share prototypes with a target audience to see how they interact with them. This can be done either in person or online, and the tester is encouraged to talk through their thought process as they navigate the product or site. This is a great way to gauge whether a customer’s mental model aligns with the actual design. UX research is a relatively new but growing field. You don’t need a specific degree to be a UX researcher, but you should have experience with technology and an understanding of people’s behavior. Common backgrounds include, but are not limited to, psychology, anthropology, sociology, marketing and communications, and information science. Podcasts such as UIE Brain Sparks, UXPod, and Boxes and Arrows are also good resources. Once you have a firm understanding of what it means to be a UX researcher, try to talk to people in the field. Networking is one of the best ways to land a new job. If you’re employed and your company has a UX research team, see if they’ll sit down and talk to you. Ask if you can join one of their moderated sessions and take notes. 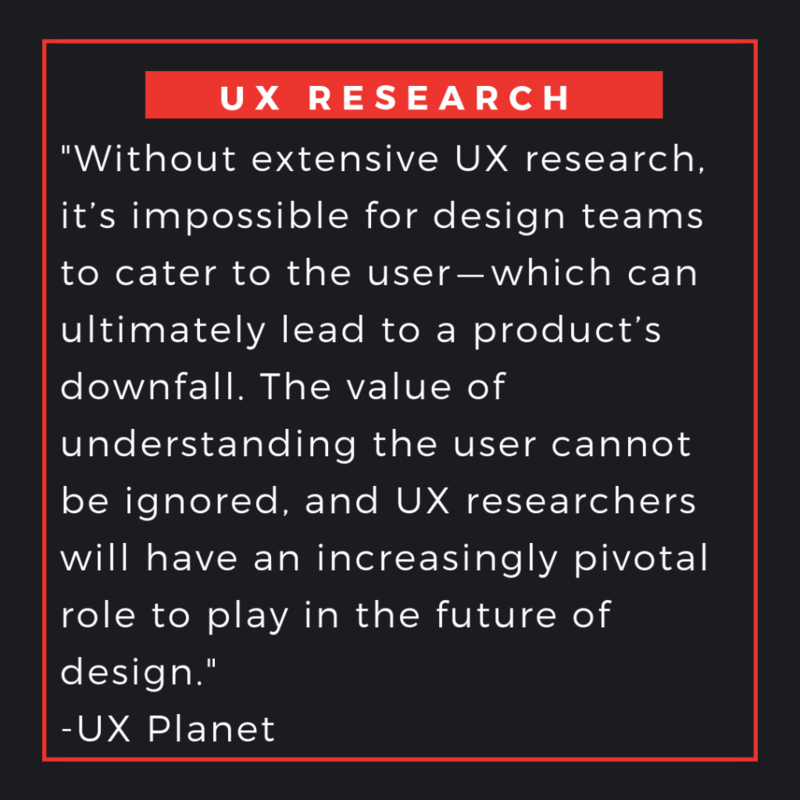 If your company doesn’t have a UX research team, talk to your UX design team, market research team, or marketing team. Ask if you can shadow them on an upcoming research project. You can also contact local universities that conduct UX research or applied research and discuss volunteering with them. Similar to an internship, shadowing and volunteering to help UX researchers will provide you with proven experience that you can build a portfolio with and show to prospective employers. Lastly, check out the User Experience Research Professionals Association to see if there are any upcoming events you can attend. UX is a growing and lucrative field. While a UX designer is more concerned with the consumer-facing final outcome of a project, a UX researcher focuses on the customers’ wants and needs. Observation, understanding, and analysis are the three key methodologies employed by UX researchers and can are done via face-to-face interview, online surveys, or usability testing. A UX researcher should have a solid understanding of analytics and the design process as a whole, but they also need soft skills such as adaptability, an understanding of human behaviors, and a willingness to collaborate. As a UX research degree is non-existent, the best way to break into the field is to immerse yourself it. Read as much as you can on the topic, network with people in the field, and either shadow or volunteer on projects in order to build a portfolio that you can later present to prospective employers. 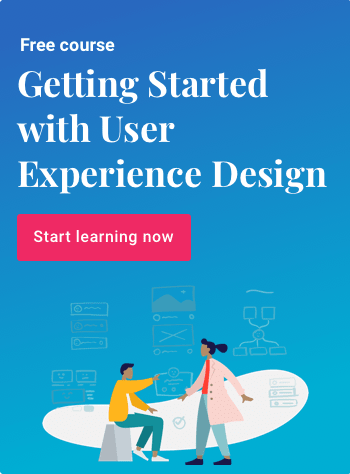 Ready to further develop your UX design skills? Springboard’s UX Career Track is a self-paced, mentor-guided bootcamp with a focus on helping you land your dream job in user experience. Find out more!